Grandma's Knitting Place: Lots of little things! 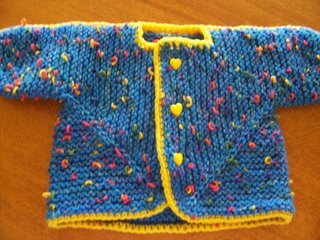 This is my latest addiction - a tiny version of Elizabeth Zimmerman's Baby Surprise Jacket. 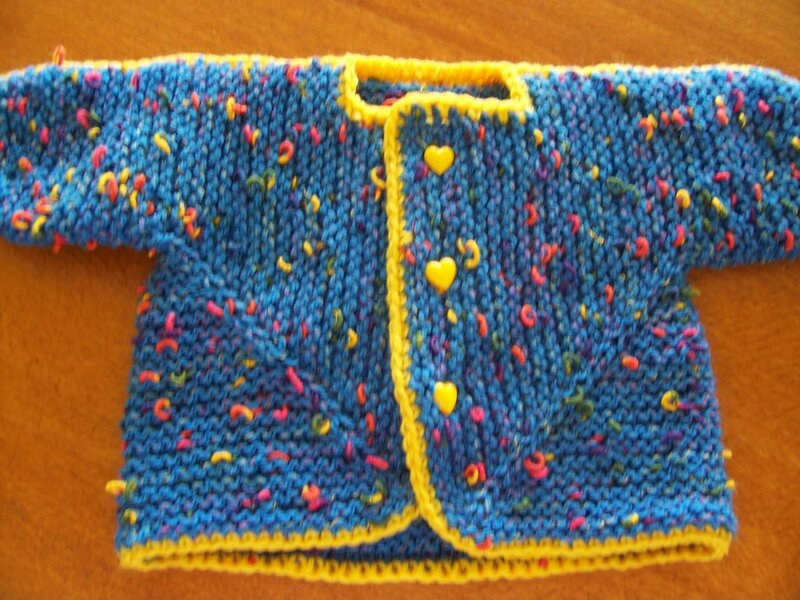 This makes a gorgeous newborn sized jacket in about three hours , go to whoa! It is the brainchild of Mariella on the knitbabysurprise group - and it is the best little stash buster I know! Takes under 50 grams of yarn, so marvellous for using up all the odd balls. I found an amazing shop in Toowoomba called All Things Local, and they will take anything I can give them in the way of knitwear to sell for me!! So I am stockpiling lots of nice little things for next winter - these little jackets are going to go down big I think. The blue sweater is made in Wig gles yarn. Here's a better pic of it. Isn't it the cutest yarn - has all these little wiggles of colour through it - a friend in Boston sent it to me - she sent two balls each of red, blue and yellow - so can't wait to knit some more! I have done a bit of tweaking to the original Tiny Version - can't leave a pattern alone, me. Now all I have to do is get it written down before it disappears from my head for the next time. I made all of these little sweethearts in a week by the way - one a day!! Loved your happy knitting with your friends picture! If I blow it up and use it as my "wallpaper" on my computer I may feel like I'm in on your group! Look at all those terrific smiles! Did you write down what your mods for the teeny BSJ were? I'm just wondering what you did and why you did it,not having made it myself yet, the little version, I mean. Keep going on your blog, it's so fun to see what you have been up to down Unda! I just love these tiny BSJ's! I would love to know what your changes were to get knit these little gems?? 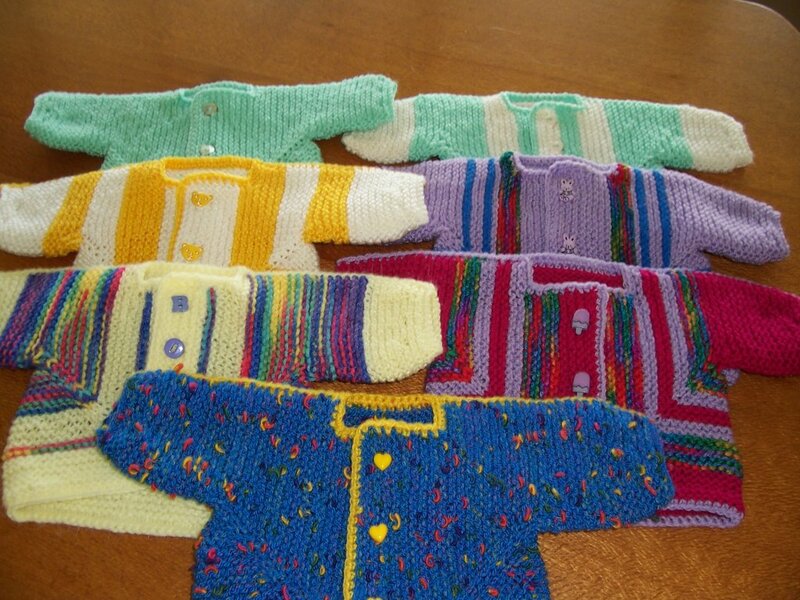 Cute tiny baby surprise sweaters! Yvette your work is just awsome. i am only to pleased to pay for all costs. Lesley - I need to have your email address to reply to you!